Just in time for the holidays! 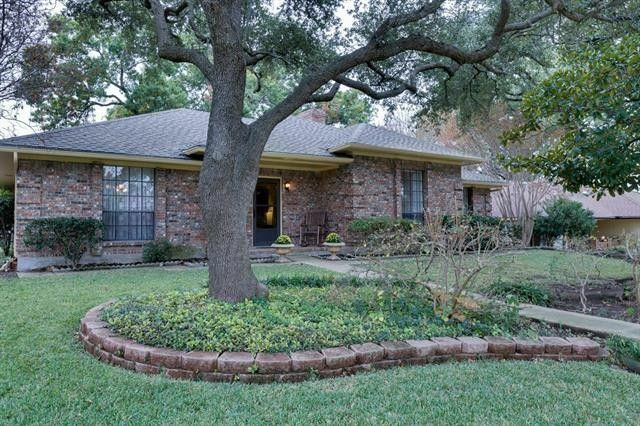 This charming single story home is located in an established neighborhood with mature trees. The Family Room features a vaulted ceiling, custom built-in and brick fireplace with gas logs. The Kitchen offers Oak cabinetry, breakfast bar, double ovens, smooth cooktop, stainless dishwasher and cozy Breakfast Nook. The elegant Formal Dining Room could also be used as a Study. The spacious Master Suite boasts separate His & Her vanity areas with walk-in closets. The Laundry Room has a handy sink and storage cabinets. The flexible-use Sunroom is not included in the square footage. It also has an extra deep garage, tons of storage, gutters, sprinkler system, open patio and so much more! Directions: I-30 to Rockwall, North on Ridge Rd, Left on Goliad, Left on Boydstun, Right on Ridgeview, Left on Kenway, Left on Village Green. From Hwy 66, South on Lakeshore, Left on Shoretrail, Left on Village Green.